It's exciting to find remnants of Europe's Old World that somehow missed the 21st-century bus. But much of what we see touted as the "real thing" is actually a cultural cliché kept alive for the tourists. 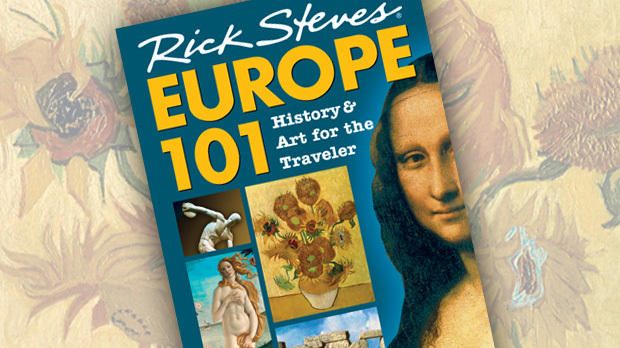 To really feel the touch of history, when I'm traveling I like to find a guide (or a friend who functions as a guide) who actually lived through some of Europe's most momentous events. In Prague, I walked the path that my Czech friend Honza walked in 1989 with 100,000 of his countrymen as they demanded — and finally won — freedom from their Soviet overlords. The walk culminated in front of a grand building. Honza turned to me and said, "Night after night we assembled here, pulled out our keychains, and all jingled them at the president's window, saying, 'It's time to go home now.' Then one night we gathered…and he was gone. We had won our freedom." Hearing Honza give his personal account of the Velvet Revolution as we walked that same route drilled into me the jubilation of a small country winning its freedom from a big one. In Croatia, my bed-and-breakfast host Pero, whose war injury will be with him for the rest of his life, held up the mangled tail of a mortar shell he pulled out from under his kitchen counter. He then described how the gorgeous stone and knotty-wood building he grew up in suffered a direct hit in the 1991 siege of Dubrovnik. I took Pero's photograph as he held the mortar...and smiled. I had asked him not to smile, but he did it anyway. He seemed determined to smile — as if the smile signified a personal victory over the destruction the mortar had wrought. My Norwegian uncle, Thor, lived through the Nazi occupation of his country. 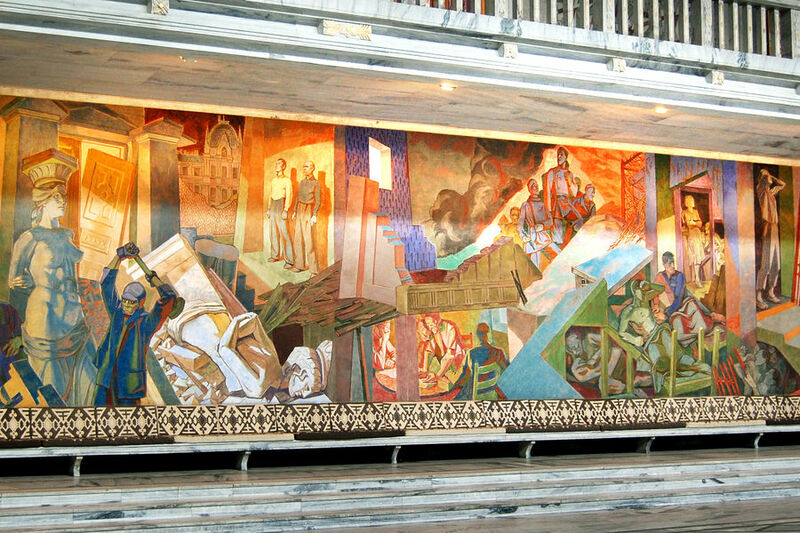 He liked to take me into Oslo's magnificent city hall to appreciate the huge "Mural of the Occupation." It offered him a chance to share those dark days with the support of powerful art. 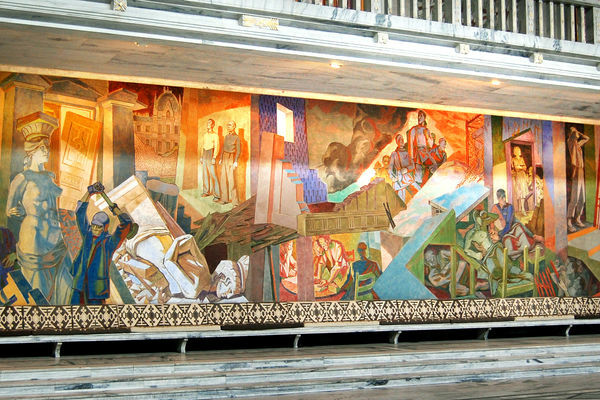 Walking slowly, as if the mural showed his personal experience, he told the story in a present-tense whisper: "The German blitzkrieg overwhelms the country. Men head for the mountains to organize a resistance movement. Women huddle around the water well, traditionally where news is passed, while traitors listen in. While Germans bomb and their army occupies Norway, a family gathers in their living room. As a boy clenches his fist and a child holds our beloved Norwegian flag, the Gestapo steps in. Columns lie on the ground, symbolizing how Germans shut down our culture by closing newspapers and the university. Finally, prisoners are freed, the war is over, and Norway celebrates its happiest day: May 17, 1945 — the first Constitution Day after five years under Nazi control." Thor then finished by waving his arm wide and saying, "And today, each December, the Nobel Peace Prize is awarded in this grand hall." 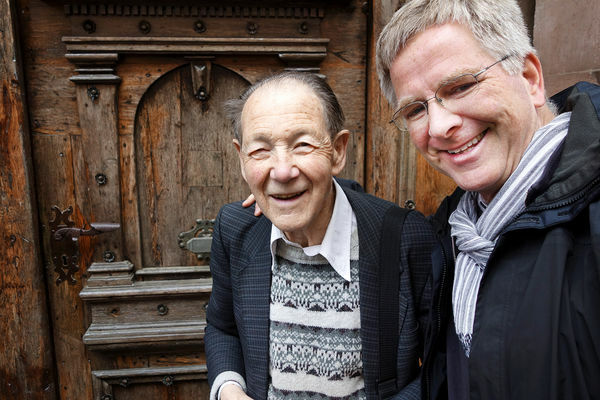 In Bacharach, a small town on Germany's Rhine River, the long-retired schoolmaster Rolf Jung loves taking visitors on a town walk. He recounts the difficult days during World War II when there were no fathers left, when the sky was filled with bombers, and how he was the class expert in identifying airplanes. When a plane was shot out of the sky, he and his buddies would mount their bikes and pedal to the scene of the crash. One day he approached what he thought was a plane with a huge upright wing. Upon arrival, he saw it was just the tail section of a massive new American airplane — and, even as a little kid, he realized Germany would ultimately lose the war. His post-war memories — hunger relieved only by sporadic care packages from Americans — has powered his love of showing American visitors around his village, which he still does even in his 80s. Of course, these encounters can happen anywhere. El Salvador's history is so recent, tragic, and fascinating that anyone you talk to becomes a tour guide. My Salvadoran guides with the greatest impact were the "Mothers of the Disappeared." They told me their story while leafing through humble scrapbooks with photographs of their son's bodies — mutilated and decapitated. Learning of a cruel government's actions from those sad mothers left me with a lifetime souvenir: empathy for underdogs courageously standing up to their governments. Tourists can go to Prague, Dubrovnik, Central America, Norway, or the Rhineland and learn nothing of a people's struggles. Or, if traveling to broaden their world views, they can seek out opportunities to connect with people who can share perspective-changing stories. One of the greatest rewards of travel comes from the people you encounter — especially if you're open to letting them share a moment of their history.